The SSL Network I/O:SDI provides bidirectional bridging between embedded SDI Audio, Dante, MADI (2 x optical, 1 x coax I/O), and AES. The SSL Network I/O: SDI has eight 3G-SDI paths with embedders and de-embedders for 16 audio channels, and provides bidirectional bridging between embedded SDI Audio, Dante, MADI (2 x optical, 1 x coax I/O), and AES. Features include channel-by-channel routing (via control application), comprehensive redundancy, and sample rate conversion to and from SDI. Evident Productions founder Peter Blue was involved in significant system improvements for the FIFA Congress itself, as well as providing the feeds to over 20 international broadcast networks covering the event. 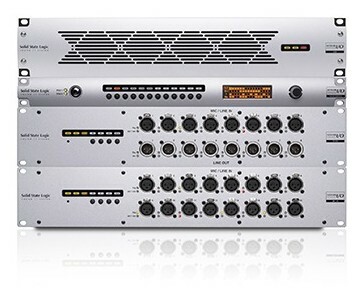 The audio source was taken from the Dante Break Out connections on the Lake LM26 processors (connected to Front of House), and contained six different translations plus the main left and right house channels. For Blue, specifying the Network I/O for this crucial role turned out to be more straight-forward than he had expected: “I needed to send every one of the translations simultaneously, via the HDSDI/Audio embed system, to all of the global satellite feeds as well as send the same signal to every in-house monitor across the entire venue. At the same time, and using the same HDSDI/Audio embed system, we needed to be able to handle any feeds coming in from SNG trucks which needed to be patched quickly and the audio split out to Front of House for mixing. When I saw the SSL box I thought ‘wait a minute, this fits the bill for everything’. It does both the embedding and the de-embedding for different protocols simultaneously, and it’s taking care of the bridging from the audio side of things. 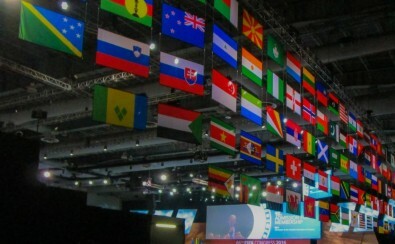 The 66th FIFA World Congress games were recently held in Mexico City. The Network I/O: SDI was connected to the redundant Dante network and that audio was embedded into several video formats and passed onto the broadcasters. “Inside the Network I/O we were creating four different basic feeds,” says Blue, “...The house monitor and a broadcaster world view in three different flavours - 1080i, 720p, and 480i - just so that the trucks and uplinks could easily convert specifically for their own needs. The SSL Network I/O is available in four configurations; SDI, MADI, Stageboxes and AES. Network I/O: SDI. This model provides bi-directional bridging between embedded SDI, Dante, MADI, and AES. It handles eight SDI circuits, each capable of embedding and de-embedding, as well as dual Dante and triple MADI connectivity (2 x optical, 1 x coax), and 16 channels of AES I/O. Network I/O: MADI provides MADI-Dante connectivity featuring 32-bit MADI control tunnelling, network GPIO connectivity and comprehensive local confidence monitoring via the front panel- accessible headphone amp. Network I/O: Stageboxes It utilizes the SSL SuperAnalogue design enabling easy deployment of mic preamps, line inputs and monitor feeds around a facility. Network I/O: AES This model provides 32 Pairs of AES3 audio I/O connectivity to redundant Dante network connections. Sample Rate Convertors allow seamless integration of unlocked AES3 sources.